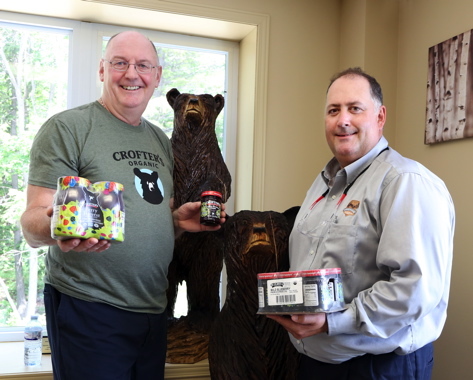 (From left): Crofter’s Organic co-owner Gerhard Latka and Arrowhead Systems product manager for case handling product Chris Cunningham hold samples of Crofter’s delicious organic spreads at the new, highly-automated facility in Seguin, Ont. Up until very recently, the picturesque Northern Ontario cottage country town of Parry Sound could lay much of its international claim to fame at the skates of hockey legend Bobby Orr—thanks to the breathtaking skill and talent this home-grown superstar showed at a multitude of arena across North America jam-packed with adoring hockey fans during his illustrious career. But small places like Parry Sound—a popular cottage town located some 250 kilometers north of Toronto in the UNESCO Georgian Bay Biosphere Reserve and boasting the world’s deepest natural freshwater port—can’t survive on past sporting glories alone. Blessed with a thriving local tourism industry and virtually endless possibilities for year-round outdoor recreation, Parry Sound is also a fertile ground for progressive entrepreneurial companies like Crofter’s Organic, acknowledged as the leading manufacturer of organic fruit spreads and preserves in North America. Started in 1989 by German immigrants Gabriele and Gerhard Latka, Crofter’s provides a compelling example that size is not everything when it comes to achieving success in the food processing business, especially in the fast-growing organics segment. 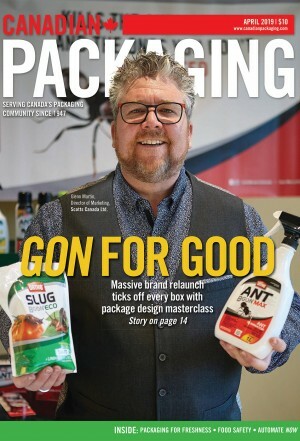 Currently employing 57 full-time people, the family-owned company has spent nearly $18 million in the past four years to not only modernize its existing Parry Sound production site, but also start up a second manufacturing plant in the neighboring community of Seguin Township. Nearly 88 per cent of its manufactured output is exported to the U.S. market which continues to grow, and now the company’s products are exported to Germany with CETA (Comprehensive Economic Trade Agreement) and to Japan via the Canadian Organic Regime/Japan (JAS) equivalency. According to the company’s hands-on owner Gerhard Latka, both plants house an extensive arsenal of high-performance production and packaging machinery designed and integrated to keep the jam manufacturer’s labor and other productions costs at highly competitive levels. Available in various jar sizes, Crofter’s has three different product lines and 26 flavor profiles of certified organic jams, preserves and spreads. 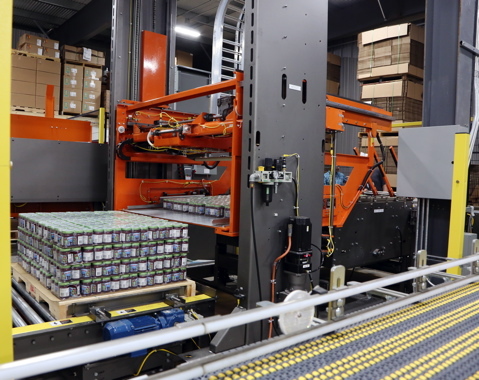 The jars in the foreground, and in the jars in the right background, sit atop and within corrugated trays manufactured by Moore Packaging Corporation. Combined, both plants ad up to a total of over 70,000 square feet of production space. Crofter’s purchased a Priority One/Busse Xodus low-level bulk depalletizing system (above left) and a Priority One/Busse palletizer (above right) from leading packaging machinery supplier Arrowhead Systems, Inc. of Waterloo, Ont., who helped to integrate not only these two machines, but all the other key pieces of production equipment at the company’s new facility in Seguin. The production lines at both facilities are fully-automated, explains Latka, with very little human interaction required outside of machine operation. 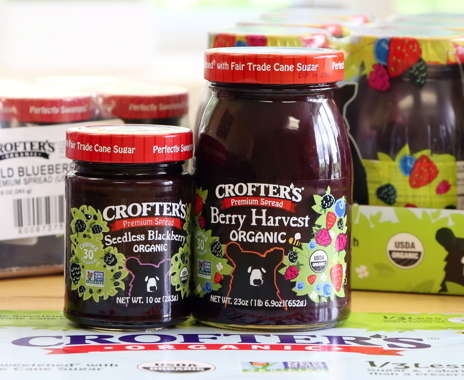 While the company had to rely mostly on locally-grown crops back in the early days to make its jams, preserves and fruit spreads, “Today Crofter’s operates a global supply chain to purchase ingredients from around the world,” notes Latka. “That said, we still exclusively use organic wild blueberries sourced from the Quebec Wild Blueberries co-op, located in the heart of the boreal forest north of Quebec City,” says Latka, noting that 100 percent of the products it makes are certified organic, sweetened with either “fair trade”-certified organic sugar or organic white grape juice concentrate as an alternative sweetener, and typically containing one-third less sugar than most of the conventionally mass-produced brand-name jams out in the market. 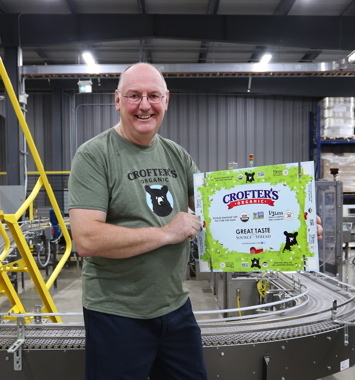 Crofter’s Organic co-owner Gerhard Latka holds up an example of a corrugated flat produced by Barrie, Ont.-based Moore Packaging Corporation. The company’s Just Fruit Spreads line of premium-quality, fruit-juice sweetened-spreads in Apricot, Black Currant, Blackberry, Raspberry, Seville Orange, Strawberry, Superfruit, and Wild Blueberry flavors. The high-end Superfruit Spreads line named after four different continents—Asia, Europe, North America, and South America—sweetened with fair-trade cane sugar and incorporating 10 so-called “superfruits” high in antioxidants derived from the respective geographic regions. 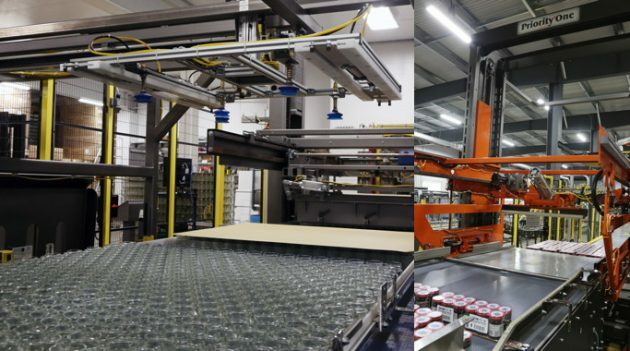 After going through a bottling and pasteurization process in the lower level of the Crofter’s Seguin-based facility (left), jars move along a Ryson spiral conveyor system to the upper floor for coding, labeling and secondary and end-of-line package processing. According to Latka, the Premium Spread product line is currently Crofter’s bestselling line, especially the 16-ounce containers, while strawberry remains the most popular flavor. Says Latka: “We currently operate one 10-hour shift every weekday. Arrowhead conveyors form the focal point of product movement at the Crofter’s facility, quickly and quietly moving product from the opening fill to the end-of-line. 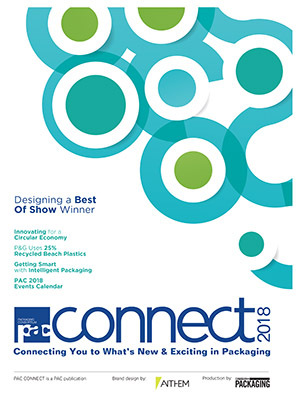 To help the Seguin plant hit the ground running smoothly from the get-go, Latka sought out the expert advice of Chris Cunningham, product manager for case handling product at the Wisconsin-based packaging machinery group Arrowhead Systems, Inc. 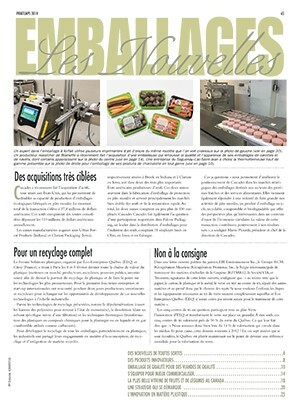 Well-known for its expertise in conveyor systems integration and fully-automatic end-of-line packaging equipment, Arrowhead immediately proceed to design, commission and integrate a range of ‘best-inbreed’ packaging machinery and equipment that ultimately helped Crofter’s to triple its weekly output to three million cases per week. 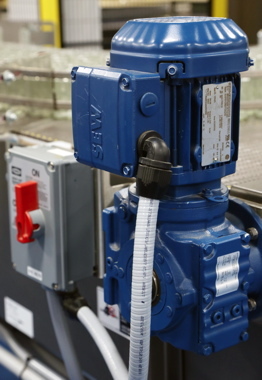 After the glass jars have been depalletized, a SEW-Eurodrive motor provides the power to the Arrowhead conveyor system at the Crofter’s facility. Merv 15-rated air quality in cleanrooms. The higher the value—with 16 being the highest—the fewer dust particles and other contaminants pass through. A Langguth E65 pressure-sensitive labeler applying front and back labels to filled and sealed Crofter’s jars at speeds up to 300 containers per minute. 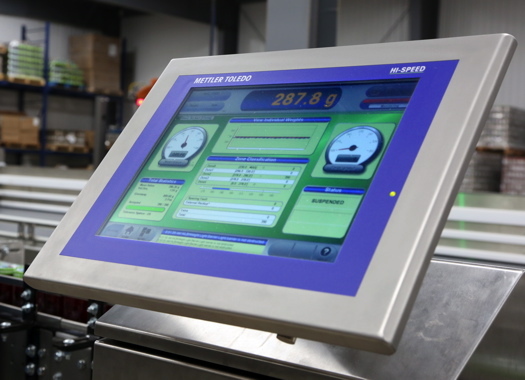 According to Langguth, its E65 pressure-sensitive labeler machines are offered with Rockwell Automation’s Allen-Bradley or Siemens controls, and can include fully-automatic speed control in relation to upstream/downstream container flow. Depending on label length and number of labels on the container, a speed of up to 500 containers per minute is available. The Langguth hotLAN 310 hot-melt labeler offers Crofter’s a full wrap labeling on round containers, utilizing a Nordson hotmelt adhesive completely closed system with no return glue and no chance of the glue being contaminated and no tarring of the tank. The hotLAN 310 is available with all the options offered with the E65. “When we thought about all the equipment we wanted in this new facility, we were puzzled as to how we were going to lay it out, but Chris and his Arrowhead team came in with full confidence and put all of our fears to rest,” Latka recalls. 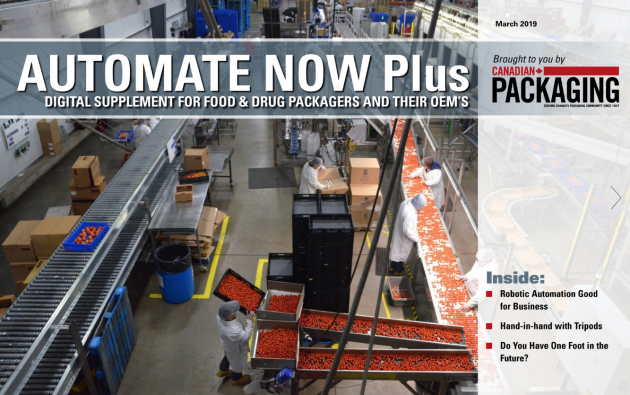 “They worked from Day One to help make the installation a success,” Latka adds, citing the seamless integration of the Xodus model low-level bulk depalletizer that quickly and safely moves tiers of glass jars onto the accumulation table, before they are conveyed single-file to the filling room. 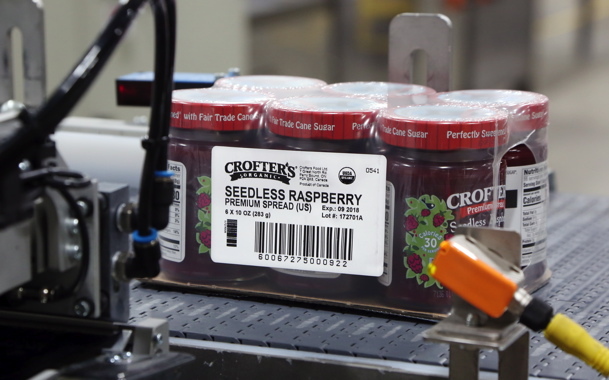 A Domino multiple QR-capable case label applicating system is used by Crofter’s to apply a wide range of product identification onto a six-pack of Crofter’s Seedless Raspberry Premium Spreads. Built by the Busse/S.J.I. division of Arrowhead, the Xodus depalletizer comes standard, according to Cunningham, with Category 3 safety features such as interlock safety doors, muted light curtains on the entry and discharge areas. “Any attempt at entry trying to bypass the light curtains will stop the machine,” says Cunningham, adding that a high-speed Xodus can depalletize approximately four layers of jars per minute. 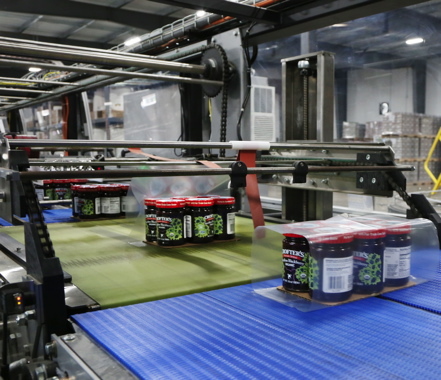 Crofter’s uses a Priority One palletizing systems purchased from Arrowhead to stack levels of jam jars, featuring safety guard rails and conveyor by Regal Beloit. 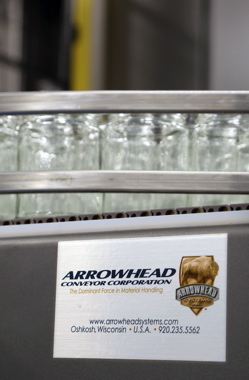 From there, the filled and sealed jars are elevated on a Ryson spiral elevator to the upper production floor area to pass through either of the two Langguth labelers (full wrap paper, or pressure-sensitive self-adhesive labels front and back). The pressure-sensitive labeler is equipped with a Domino laser system for printing the QR code on the backside of each jar at a line speed of 250 jars per minute. “We are probably one of the first companies in the food business to be able to print the QR code with a Domino laser system directly onto the backside of the jar’s label,” Latka notes. The labeled jars are then packed in either two-, six- or 12-packs, which are then passed through a short heat-tunnel to apply a tight layer of shrinkwrap to keep the multipacks together, with a corrugated pad used as a base for the larger-sized sixpack bundles and 12-pack trays for extra support. 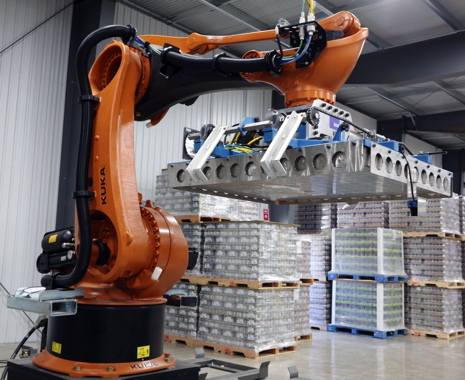 A large KUKA Robotics KR 700 PA robotic palletizing system is used by Crofter’s to build up mixed product pallet loads via a rare earth magnet to pick up layers from surrounding pallets one at a time. 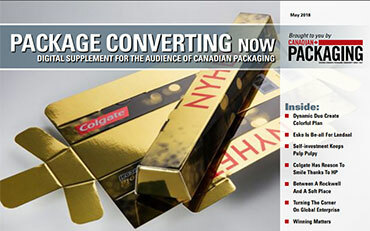 “For club pack customers we also provide the option of packing six two-packs of jam into 12-pack trays,” notes Latka. The six-packs and 12-pack trays then have case labels applied by twin Domino case label printers with pack information for distributors, including scannable barcodes and QR codes for full traceability and automated order picking. Applying a QR code onto single jars running at a line speed of 250 jars per minute was an engineering accomplishment, according to Latka, that has allowed the plant to employ a special Kuka Robotics KR 700 PA robotic palletizing robot system to build mixed loads of products while sustaining 100 per cent traceability. “It uses a rare earth magnet to safely pick up the layers one at a time to build the mixed-load pallet,” explains Cunningham. “We also add QR codes onto the case labels and on the pallet tag—the latter of which we use with our Kuka Robotics palletizing system to prevent any miss-picks,” relates Latka. Like most leading food processors, the Crofter’s plant follow a strict HACCP (Hazard Analysis Critical Control Points) food safety regime protocol, and in 2011 achieved the globally-recognized SQF Level 2 certification of the Safe Quality Food Institute (SQF). 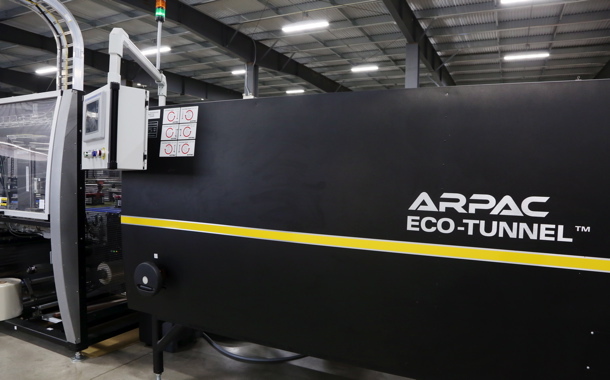 After six-packs of filled and sealed product have a corrugated pad placed under it and have a plastic sheet placed over it, it moves through an Arpac Eco-Tunnel shrink tunnel (below) to shrinkwrap the Crofter’s product. According to Latka, the new plant is far more sustainable and energy-efficient than the older Parry Sound facility. “Our new vacuum kettles are highly energy efficient, with rotary coils heating the fruit mass from the inside,” he explains. “And because the new plant distributes the fruit mass by gravity, we engineered the new buildings to create a 15-foot drop from the release valve of the L&A vacuum kettles to the entrance valve of the filler bowl,” he says. Most of the plant’s daytime energy requirements are supplied via a 530 kWh natural gas generator, a reliable source of low cost energy for the rural plant, and a source of free heat energy. Two million BTU/hour of heat is generated when it is running, and if not captured would be lost into the environment. This free source of energy does not go to waste. A connected heat exchange system transfers the generator heat into a water loop that circulates through the plant where the recovered heat is used to supply the kettles and pasteurizer with production energy, provide in-floor heat to the plant, warehouse and offices, and provide other users with heated water as needed. The system is so efficient that heating boilers in the plant function as back-up heat sources that basically never comes on, other than on the coldest Northern Ontario winter nights. At night when there is no production, the plant uses Ontario Hydro’s reduced night rates to power the plant. A Mettler-Toledo Hi-Speed CM9400 Canweigh checkweigher ensures proper jar fill levels. The process of making jam requires high amounts of energy because the fruit mass must be pasteurized to 90C, and after hot-filling the jars and capping them, it passes through an extra pasteurization process where the jars are sprinkled with hot (92C) water in a heat tunnel. Within minutes, the 90C jars must be cooled to 40C. To accomplish this, a 300,000 liter closed-return cooling water system sprinkles 20C water over the jars as they pass through a cooling tunnel. The cool water picks up the heat from the jars, which raises the temperature of the cooling water to 35-40C. “Our trick is how to cool the water back down to 20C without the use of an energy consuming cooling unit, so after cooling the jars, the now-warm water is run through a heat exchange system around miles of piping under the floors and outside into the earth where the heat in the water is exchanged into the cooler grown to keep loading ramps and parking areas snow and ice-free in the winter,” Latka explains. “During the summer, loops located deeper in the ground cool the water back down to the 20°C temperature. “There is no additional energy consumed to operate our cooling units,” says Latka, adding that unlike most food processors, the new Crofter’s plant is not hooked up to the local municipal water supply—operating its own 270-foot-deep well instead. 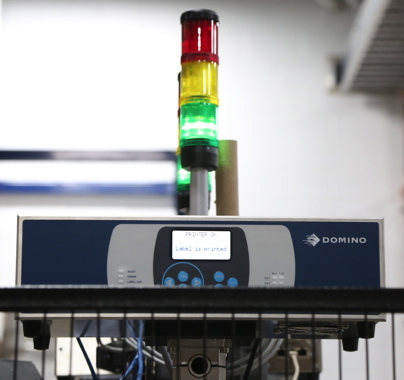 A Domino laser coder tracking the printed QR code applied to a Crofter’s product label. Moreover, Latka says that Crofter’s recycles 95 per cent of its wastewater to clean its facilities, with the remainder disposed of through a licensed waste operator, or in the future as biosolids in agriculture. According to Latka, sustainability is always a key consideration in the way the company goes about its daily business. 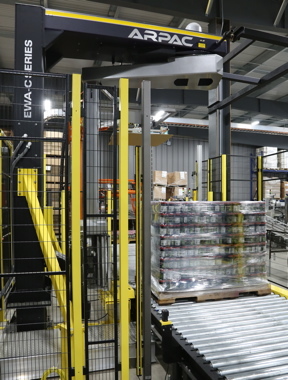 An Arpac EWA-C Series electro-wrap inline conveyorized automatic rotary tower quickly and quietly wraps a protective film around a pallet of Crofter’s product. Combined with the new leading-edge production line integrated by Arrowhead, Latka is naturally upbeat about his company’s future growth prospects and potential. “Initially we contacted Arrowhead for the purpose of purchasing a depalletizer and a palletizer,” he sums up, “but they were so proficient and thoughtful in designing how we could build our production line, that we used them to complete the entire project.